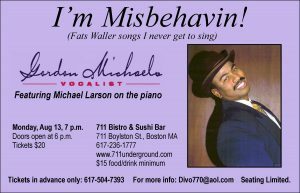 After having been in nine productions of “Ain’t Misbehavin’ “, Mr. Michaels feels it is now his turn to sing the songs he never got to sing that made this a classic great musical, including those usually sung by the women. 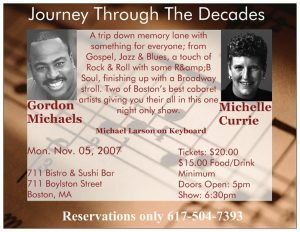 As he sings with his powerful, dramatic baritone voice as only he can, Mr. Michaels blends the stories from his tours with stories of his life. Which will surely be a Misbehavin time. 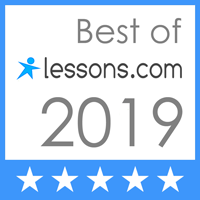 A Tribute to the men that made soul music what it is today featuring music from artists: Otis Redding, Sam Cooke, Ben E. King, Sam & Dave, Wilson Pickett, Ray Charles and many more. 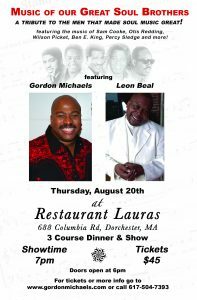 Performed as only they could be by Gordon Michaels & Leon Beal Boston’s own soul bothers. A walk down memory lane that no one should miss. 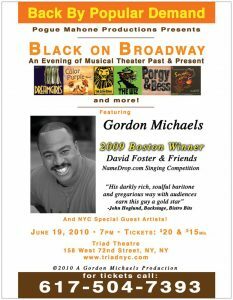 This musical revue features show stopping numbers from most of the well known traditional and new Black Musicals from Broadway and Off Broadway, including selections from Dreamgirls, Five Guys Named Moe, Ain’t Misbehavin’, Smokey Joe’s Cafe, Porgy & Bess, The Wiz, The Lion King, The Color Purple and others. If you love these shows and the music from them come have a good time. If you don’t know them then come and learn about them and have some great fun. 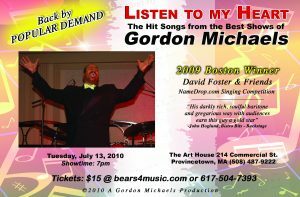 Gordon Michaels pours out his heart and soul in a evening of special selected song that range from spirituals, gospel, old R&B and pop tunes with broadway and jazz sprinkled in as only this powerful Baritone can deliver. 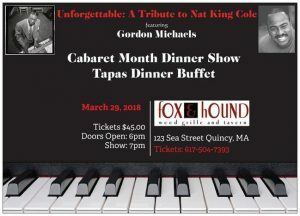 This show will lift your spirits and pull on your heartstrings. It’s not to be missed, make sure to bring a hankerchief . Is a holiday concert I put on every year as a charity event to kick off the holiday season. We sing our hearts out with some of our favorite holiday songs and some of the traditional Christmas songs but all sung with a new spin and a little chilli power to spice up your holiday season. We always have songs for all genres and something for everyone. 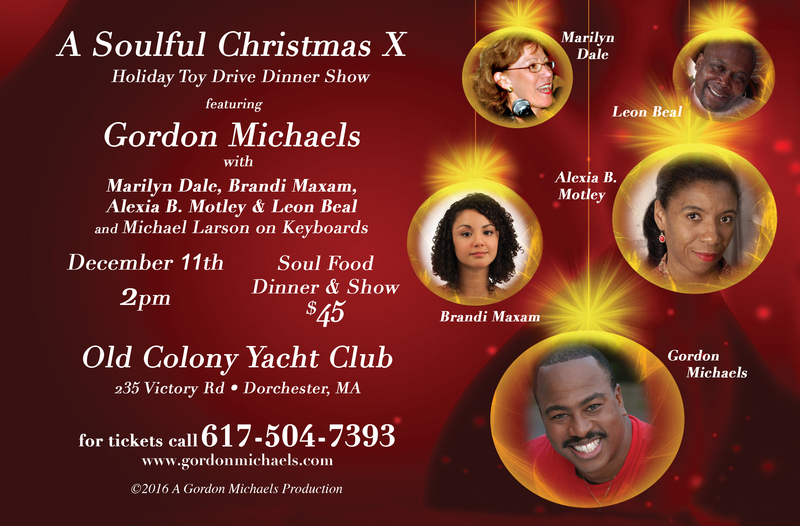 This show is always done as a Toy Drive.